Double the amount of tracks, this is exciting!!! LumaFusion keeps getting better. Oh yeah. Looks pretty great. Especially glad to have 6 tracks. It is kinda limited with only three at the moment. Also the external monitor support will be very useful. I do wonder if it will be an update or a new app? Here’s to hoping it’s an update! I hope they get blending layers (screen, multiply, dodge etc). I have it, but haven't put in the time. Would like an option for the iPad, worth the effort to get to know it? For straight up simple video editing I like it well enough. It is pretty straight forward. I think so. The more time I put into it, the more I enjoy it. Slowly building content for some iOS tutorials... and Luma will definitely do all I need it to do (as a novice). This’ll bring a lot of fx functionality to the party, I’ve been hoping they’d add it for a while. That and importing of image sequences, and eases for keyframing. Hope it will have multicore support for rendering else it's not worth it if we talk about rendering speed. 6 tracks?!?!?! That'll save me a TON of bouncing for my multi-cam videos. This is crazy huge - hope it's an update and not a new app. I'm suspecting they are adding only one more video track and the rest as title/image tracks as per my prior discussions with them asking them to add one more video track and they were reluctant to add that 4th video track for a long time (until iPads got spec'ed up lately). All I needed was that 4th video track so I could show 3 synths horizontally like I do in some of my videos. I suggested to show the 4th track only in capable iPads as a workaround but they countered my suggestion saying that the 4-track 4K video created on a new iPad would fail to load up if users tried to open the same project on an older iPad. Recently, they confirmed they are adding the 4th video track and a few title tracks and audio tracks in their v1.8 but apparently they are hopping to v2. So, likely 4 video tracks and 2 misc tracks => 6 tracks. Those 4 video tracks can also be used for titles and photos but the 2 misc tracks are non-video tracks. Not all iPads can handle 6 tracks of 4K video - not even 4 tracks of 4K video as per them. I'm suspecting they are adding only one video track and the rest as title/image tracks as per my prior discussions with them asking them to add one more video track and they were reluctant to add that 4th video track for a long time (until iPads got spec'ed up lately). So, likely 4 video tracks and 2 misc tracks => 6 tracks. Not all iPads can handle 6 tracks of 4K video - not even 4 tracks of 4K video as per them. That's still a huge help - I get some chugging when I'm dealing with 3 tracks of video and lots of edits, so I can understand. But being able to do the text annotations on a dedicated track rather than having to bounce the video first will cut down on the time spent exporting, reimporting, etc. That's the exact, same issue I have with just 3 tracks in LF. When I use up all the 3 tracks to show 3 synths in the video, there is no way to show some titles, etc. I guess 4 video tracks and 2 misc tracks is an acceptable solution for a foreseeable future. They could easily add many misc and audio tracks without issues. The issue was with the the number of video tracks, if user is using 4K video and performance of current iPads. Maybe, LF would show/hide 4-6 video tracks based on what iPad is being used. Or, they may have tweaked some performance out of their app to add 6 video tracks without issues, that would be awesome! yeah, would be awesome. The screenshot from twitter shows 6 video + 3 audio... here's hoping ! Hope they would optimize the app for the new newer iPad Pros 2018 with rounded corners and wider screens (currently wasted space around the screen in v1.7). Opacity is useful as is chroma key (although the edges while keying are pretty crunchy and aliased, could use some kind of edge smoothing) but blending modes are a different thing. I am doubting there will be 6 video tracks available, unless you use an iPad Pro. But I would be happy to be wrong, since I use an Air2. 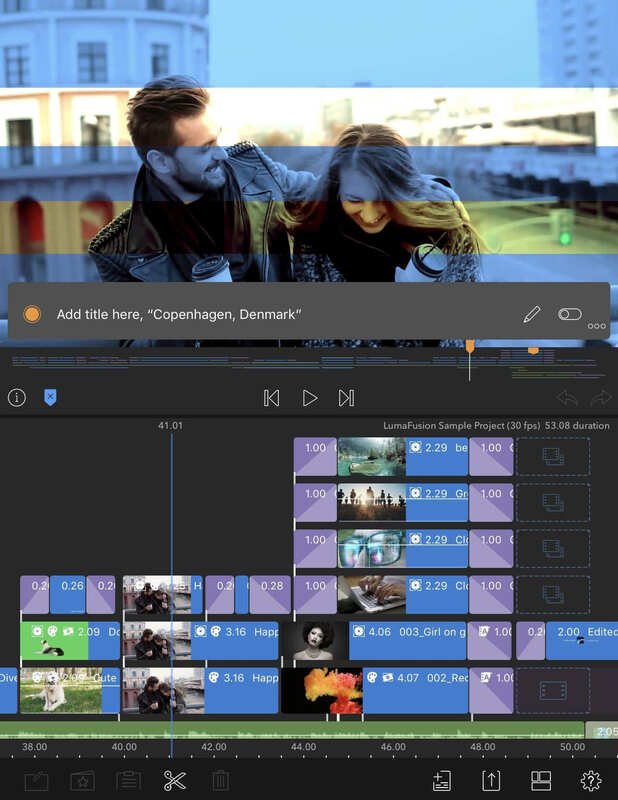 Super exciting, I wish Apple put a tenth of the effort into iMovie as the LumaFusion developers put into their app! Oh, well, gotta add more stickers to Clips! I was playing around with Luma the other day (basic "can I do this?" tests, keyframing chroma-key clips, etc) and was so blown away with its capabilities; it's really nice to see developers take the platform so seriously. I wonder if at one point they'll bring back support for third-party AUs? I wondered about this too. The impression I got reading their forum is that the user experience was not good enough for them because it depended too much on the AU developers getting things right (and when they don’t then users would blame Luma and cause headaches). I got the idea that they were just scrapping it... but who knows. Yep, that’s what I got from their Twitter feed. They’re also adding markers to the timeline and to videos. This is going to be a major help for me, I’ve been asking for markers from day one. Also they are saying that videos used in the timeline will be protected from being “optimized away” by the IPad/IPhone IOS. As mentioned earlier, blending modes would be great. I’d also like to see some more features added to the keying features, like soften edges and despill. I fell in love with Lumafusion at first sight, but these new updates are going to make me barely use Final Cut Pro. More news here, Final Cut Pro export and new video stabilisation post capture functionality is coming this year. I also read about a new FiLMIC Pro Audio app that you can use on a second device that WiFi syncs audio to video with their video app which basically turns your second device into a wireless mic sounds like it will come in handy for U Tube and video creators. Mentioned in the article.